Skunks are amazing diggers and they love making dens underground. You should be aware that these animals can actually start digging within your property so as to make a home where they can live and raise their young. One of the things you will notice is that if you have conditions that are favorable for the skunks to thrive, they will definitely choose to stick around. If there is an ample supply of food and water within your home or yard, they will not leave willingly. It is best that you ensure that the home is clean at all times. Don’t leave pet food outside and don’t leave the garbage cans uncovered. They should always be sealed tightly at all times. Skunks are omnivorous and when times are tough, they can choose to go through your cans and eat whatever they can find. Some of the places that you may find skunks living within your property are under the shed or the porch. When you find a skunk living here anywhere between April and September, you should assume that that particular skunk is actually a mother with young ones. Even though it is not always the case, the greatest likelihood is that the skunk has young ones. It is important that you be very careful when dealing with the skunks at this time of the year because if you aren’t, you may just end up orphaning the young ones. They cannot fend for themselves or move around at a tender age and so trapping and relocating the mother without her young can be a death sentence for the young ones. Skunks are great mothers and if they feel threatened or frightened, they will definitely move the young ones into a new den. 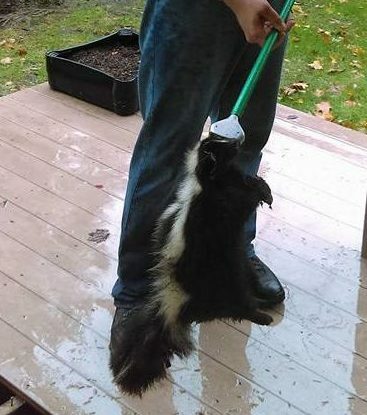 It is not always a humane thing to evict a skunk with young ones. Trying to evict them can mean that the mother may choose to abandon the young ones altogether or she can get separated from them. If you have a skunk living under the shed or porch around this time of the year, be very patient. The first option that you have in such a situation is to do nothing at the moment. Usually, the skunks will only live in a den for a very short time. By the time summer ends, the babies will be fully independent and they usually disperse and leave the family group. You may choose to wait until the babies have grown and left the den and then close off the access points to ensure that no other animals move in.